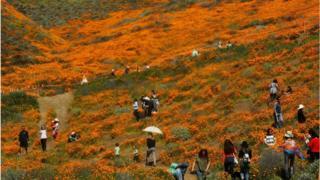 A Southern California town was forced to temporarily ban tourists from visiting a golden poppy “super bloom” after they caused a safety nightmare. Lake Elsinore officials on Sunday closed Walker Canyon, citing a “public safety crisis” as visitors trampled blooms and caused traffic jams. After being overwhelmed by the massive influx of visitors on Friday through Sunday in what was described as an “unbearable” weekend, officials briefly shuttered access to the canyon on Sunday night. But by Monday morning, the canyon was re-opened, with officials saying it was “not feasible for us to keep visitors away from Walker Canyon”. The rare occurrence, which usually happens once a decade, came after a heavy rain season that brought an end to the state’s seven year drought. A super bloom occurred in 2017 as well, but a city official described this year’s as the largest Lake Elsinore has seen in 30 years. “We’ve seen much larger crowds this year because the bloom is bigger than ever,” Nicole Dailey, Assistant to the Lake Elsinore City Manager, told the BBC. Ms Dailey said Lake Elsinore doesn’t normally attract tourists, but media coverage has identified the Walker Canyon trailhead nearby as a prime location to catch a glimpse of the super bloom. Lake Elsinore Mayor Steve Manos described it as “insane” in a post on Facebook.